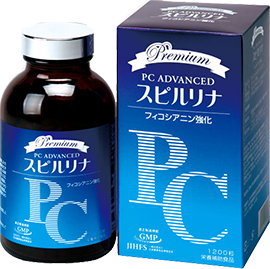 PC Advanced is a product sold in countries other than Japan. It is Spirulina combined with Spirulina 93%, Spirulina pigment (Phycocyanin) 7%. It has been confirmed that phycocyanin which is a blue pigment contained in Spirulina has many health effects such as renal function improving effect, antioxidant action, action of lowering creatinine value.